We are excited to showcase Julz, who joined our team last Summer! 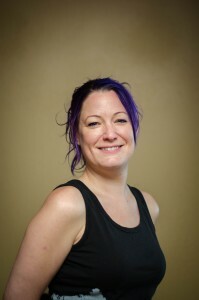 She’s been practicing her gift here in the Rockies for ten years strong and brings an intuitive blend of deep tissue, structural integration, and sports massage that provides relaxation as well as lasting results. How did you get into massage therapy and bodywork? What would you describe as your massage specialty? What does a typical session with Julz consist of? “A typical session with me begins with a few easy history questions. I like to know what your body does as far as work, hobbies and play or sports. I’ll also do a quick viewing which you may or may not notice as I assess the body and make a game plan. I approach bodywork very seriously so I don’t talk during the session, but I’ll check in occasionally. I zen out in muscle land. My hands feel tension and work accordingly. I’ll warm up the tissues before I begin my work. I use a lot of deep slow strokes to lengthen soft tissue layers. I like to work on those trigger points that cause so, so many problems. Trigger point referral pain can sometimes mimic painful conditions such as carpal tunnel, sciatica, and frozen shoulder, and releasing the right trigger points can alleviate that referred pain.